Vice President Joe Biden spoke Wednesday at Wake Forest Biotech Place in Winston-Salem, encouraging scientific research and highlighting the type of job creation needed in a changing economy. Biden spoke to a large crowd at a former R.J. Reynolds Tobacco Company facility that now houses cutting-edge biotechnology research. The location opened in February and is expected to bring 450 researchers and support staff to the Piedmont Triad Research Park. 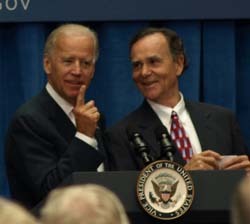 Biden was introduced by Carolina Liquid Chemistries President Phil Shugart. Shugart, whose company is located at Wake Forest Biotech Place, recounted the story of his father and grandfather growing tobacco in the same place that he would later build a chemical engineering plant. More. We atAuroraare trying to join theList Top Engineering Collegesby creating new practices in the Engineering Education in India. We request you all to have a look and let us know how we can improve our educational techniques. I am thinking about starting. Thank you for this information, it has been educational and helpful to me. What is the conclusion of this visit? Did he wrote the persuasive essay already like this one https://persuasivepapers.com/sample-of-persuasive-school-essay/?